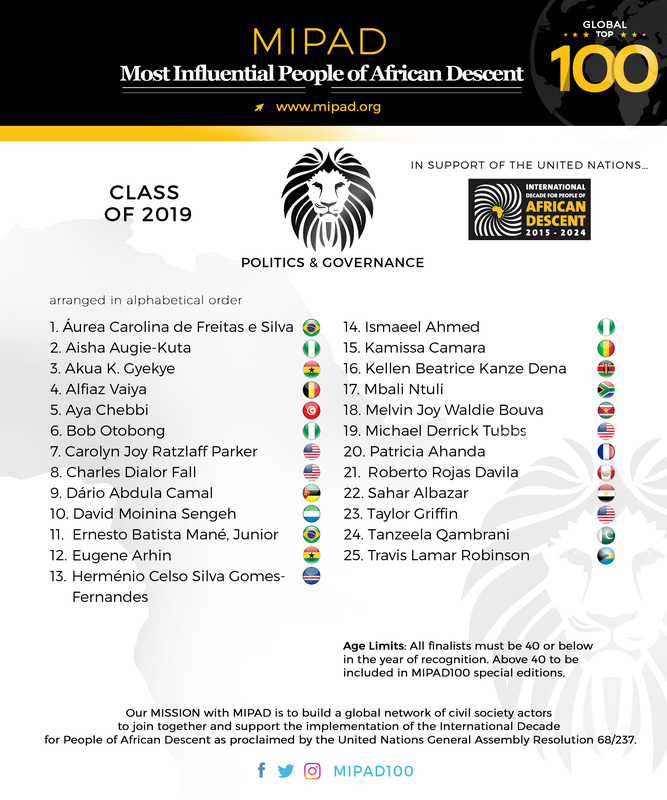 NEW YORK CITY, United States of America, 25th March 2019 – It is with great honor we begin to unveil the 2019 Most Influential People of African Descent (MIPAD) global 100 list to recognize the positive contributions made by people of African descent, worldwide, across four categories, starting with the release of POLITICS & GOVERNANCE category. MIPAD is a unique global list that identifies, in total, 100 outstanding individuals under 40, pairing those based outside Africa in the Diaspora with their counterparts inside Africa across four categories: Politics & Governance, Business & Entrepreneurship, Media & Culture, and Humanitarian & Religious. Our mission with MIPAD is to build a progressive global network of civil society actors to join together and support the implementation of the International Decade for People of African Descent, 2015 - 2024, as proclaimed by the United Nations General Assembly Resolution 68/237 and now officially recognized by the African Union (AU). Please join us in congratulating the 2019 MIPAD honorees for their contributions to societies around the world, for their resilience and strength in the face of adversity, BRAVO! The Recognition Week (Diaspora) in honor of the 'MIPAD Class of 2019' is slated for September 2019 in New York City, following the opening of the 74th UN General Assembly, click HERE to see provisional schedule. Most Influential People of African Descent (MIPAD), is a global civil society initiative in support of the United Nations International Decade for People of African Descent, focusing our efforts on the 1st pillar; RECOGNITION. MIPAD publishes a unique global 100 list that identifies high achievers of African descent worldwide, pairing those based across the Diaspora with their counterparts inside Africa, across various verticals, annually until 2024.